For other uses, see Handy Man (disambiguation). "Handiwork" redirects here. For the album by Rik Emmett, see Handiwork (album). A handyman, also known as a handyperson or handyworker, is a person skilled at a wide range of repairs, typically around the home. These tasks include trade skills, repair work, maintenance work, are both interior and exterior, and are sometimes described as "side work", "odd jobs" or "fix-up tasks". Specifically, these jobs could be light plumbing jobs such as fixing a leaky toilet or light electric jobs such as changing a light fixture. 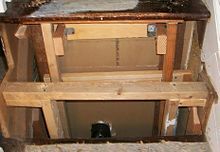 One handyman project was to repair shaky stairs; a wooden structure was built inside to prevent collapse. 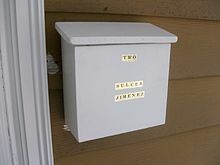 Many people can do common household repairs. There are resources on the Internet, as well as do-it-yourself guide books, with instructions about how to complete a wide range of projects. 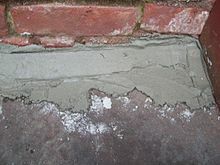 Sometimes the fix-it skill is seen as genetic, and people lacking such skills are said to "lack the handy-man gene". 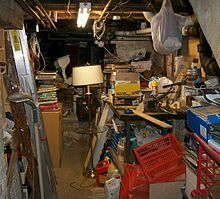 One trend is that fewer homeowners are inclined to do fix-up jobs, perhaps because of time constraints, perhaps because of lack of interest; one reporter commented "my family's fix-it gene petered out before it reached my generation." This project involved mortaring the crack between the back patio and the exterior wall to prevent water from seeping into the basement. 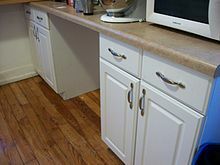 Installing kitchen cabinets is a medium-level handyman job, with multiple steps. 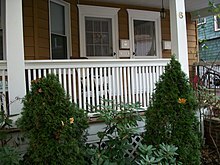 This entire porch was rebuilt by a handyman, including the substructure, columns, railings (1x1s and moldings), and door surrounds; replacing a porch is a difficult project for amateurs. One Lehman Brothers executive, after being let go from the Wall Street firm, bought a Union, New Jersey franchise from a national handyman firm. A franchise was approximately $110,000 with a franchise fee of $14,900, according to a spokesperson for a national handyman franchise. 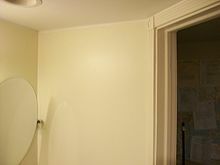 A handyman built this bathroom wall using two-by-four boards; after electricians added the wires, metal plates were put on studs to prevent nails and screws (to hold drywall) from going into electric wires; a handyman added the drywall. 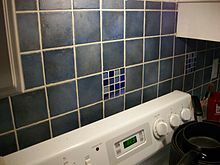 Tiling is another medium-level handyman job which most homeowners can do successfully, provided they follow directions carefully. ^ Chaplin, Andy (17 January 2013). "How handyperson schemes are helping older people this winter". The Guardian. Retrieved 1 September 2017. ^ Poulter, Sean (16 March 2012). "The end of the handyman: Now you've got to advertise for a handyperson, says job centre". Mail Online. The Daily Mail. Retrieved 1 September 2017. ^ "'Handyworker' Program Comes With All the Fixings". Retrieved 7 December 2014. ^ "Real Wealth Without Risk: Escape the "Artificial Wealth Trap" in 48 Hours ..." Retrieved 7 December 2014. ^ PAUL LEWIS (April 16, 1988). "MAN IN THE NEWS; Diplomatic Handyman: Diego Cordovez". New York Times. Retrieved 2009-10-26. ^ "Religion: Handyman to Washington". Time. 13 April 1936. ISSN 0040-781X. Retrieved 1 September 2017. ^ LIESL SCHILLINGER (November 27, 2005). "Fire the Handyman, Then Do It Yourself (book reviews)". New York Times: Fashion & Style. Retrieved 2009-10-26. HELP, IT'S BROKEN! A Fix-It Bible for the Repair-Impaired. By Arianne Cohen; READYMADE: How to Make (Almost) Everything: A Do-It-Yourself Primer. By Shoshana Berger and Grace Hawthorne. ^ Kim O'Donnel (March 26, 2007). "The Case of the Kitchen Barrel Nuts". Washington Post. Retrieved 2009-10-26. ^ a b c Michelle Slatalla (August 5, 2004). "ONLINE SHOPPER; $220 for Two Hours? Clocking Mr. Fix-It". New York Times. Retrieved 2009-10-17. ^ Steve Marshall (Australia) (May 20, 2009). "Handyman drill saves blood-clot victim". USA Today. Retrieved 2009-12-08. ^ a b c d e f g h i j k l Danielle Reed (April 29, 2003). "Chains Take a Stab At Handyman Work". Wall Street Journal. Archived from the original on October 6, 2008. Retrieved 2009-10-26. ^ Jill Priluck (December 8, 2010). "The founder's life for young VCs". CNN-Money-Fortune Magazine. Retrieved 2010-12-07. In early 2009, ... Ringwelski launched SkillSlate, a site that organizes handymen, dogwalkers, massage therapists and other solos through profiles and ratings the same way dating sites corral singles. ^ a b c d e f Deborah L. Cohen (Feb 24, 2009). "Franchising heats up as economy cools down". Reuters. Retrieved 2009-10-17. ^ a b c d e f g h PAULA GANZI LICATA (April 3, 2005). "WHERE WE LIVE; They Make House Calls: The Range of Services Grows". New York Times. Retrieved 2009-10-17. ^ "How Long Does Paint Last?". toolsaroundthehouse.com. September 2017. Retrieved 2017-09-01. ^ O'Donnell, Jayne (2009-10-21). "Rent-A-Husband handyman service raises questions". The USA Today. USA TODAY. Archived from the original on 26 February 2010. Retrieved 2009-10-26. ^ SUSAN SAULNY (May 16, 2009). "Even to Save Cash, Don't Try This Stuff at Home". New York Times. Retrieved 2009-10-17. ^ a b c Staff writer (September 17, 2012). "Find the Best Handyman for the Job". Time magazine. Retrieved 2016-08-09. ^ "Starting a Business in NJ". State of New Jersey: Department of the Treasury. 2008-11-11. Retrieved 2009-10-27. ^ BEN SISARIO (August 21, 2003). "Lost Elvis Song Turns Up". New York Times. Retrieved 2009-10-26. ^ Mary McNamara (May 29, 2009). "Review: 'Maneater' -- Jennifer (Marla Sokoloff), the sweet-faced rich girl who has the hots for her handyman". Los Angeles Times. Retrieved 2009-10-26. ^ ELIZABETH GLEICK (Apr 12, 1999). "Books: The Handyman By Carolyn See". Time Magazine. Retrieved 2009-10-26. ^ DAVID WILLIS McCULLOUGH (March 21, 1999). "Home Improvement -- Carolyn See's handyman hero can manage the tasks that matter most". New York Times: Books. Retrieved 2009-10-26. ^ Vincent Canby (September 27, 1980). "Movie Review -- The Handyman (1980)". New York Times. Retrieved 2009-10-26. ^ "The Ups and Downs of a Handyman (1975) movie review; alternate title: The Happy Housewives". New York Times. 1975. Retrieved 2009-10-26.